Providing you the best range of robus kit 400, robus kit 600, nice sliding gate motor run 2500, sliding gate motor run 1800 and nice sliding gate motor robus 1000 with effective & timely delivery. 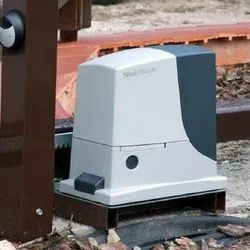 For sliding gates weighing up to 400 kg. User-friendly the Nice BlueBUS technology, enables to powerand control a maximum of seven couples of photocells usingtwo wires only. Practical the control unit and PS124 buffer battery (optional)can be connected by means of a simple connectorand can be housed directly inside Robus. Advanced RB400 is equipped with a temperature sensor adapt the motor power to the climatic conditions and at the sametime thermal cut-out. A master/slave selection automatically synchronises two motors. This means it is possible to automate 2-leaf sliding gatesset opposite each other. Intelligent thanks to the obstacle detection systemand automatic programming of the working times. Self-diagnosis by means of a flashing light.8 programming levels. Safe acceleration and deceleration can be adjusted at thebeginning and end of each opening and closing manoeuvre. Sturdy base and release in pressure die cast aluminiumand epoxy paint finish. Very quiet gear motor on bearings. User-friendly the Nice Blue BUS technology, enables to power and control a maximum of seven couples of photocells using two wires only. Practical the control unit and PS124 buffer battery (optional)can be connected by means of a simple connectorand can be housed directly inside the motor. Advanced RB600 is equipped with a temperature sensoradapt the motor power to the climatic conditions and at the same time thermal cut-out; a master/slave selection automatically synchronises two motors.This means it is possible to automate 2-leaf sliding gates set opposite each other. Intelligent thanks to the obstacle detection systemand automatic programming of the working times.Self-diagnosis by means of a flashing light.8 programming levels. Sturdy base and release in pressure die cast with easyto open handle.Very quiet gear motor on bearings. The temperature sensor: Run is able to manage force, adapting it to the different climatic and environmental conditions, while adapting the thermal cut-out protection and intensity of self-ventilation, depending on the temperature reading. Practical and functional: the control unit (and inverter on version RUN2500I), housed inside Run, can be simply connected by means of the practical connector guide. Perfect movement: the inverter enables the power supply and drive of the 3-phase motor with single-phase current at 230 Vac, acting on the frequency to adjust speed of the automation from a minimum of 8.2 m/min to maximum 15.4 m/min. Safe: the acceleration settings (at the start of the maneuvers) and the deceleration settings (at the end of the maneuver) are precise and reliable. The temperature sensor: Run is able to manage force, adapting it to the different climatic and environmental conditions, while adapting the thermal cut-out protection and intensity of self-ventilation, depending on the temperature reading. A master/slave selection also automatically synchronizes 2 motors, enabling the automation of sliding gates with two opposing leaves. 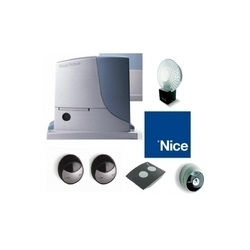 Looking for Nice Sliding Gate Motors ?